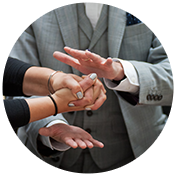 Hire a Bedfordshire Magician – Edward Crawford is a full time professional magician and mind reader performing throughout Bedfordshire and the whole of the UK. Edward specialises in a grown up, contemporary style of magic; reading minds, predicting thoughts and bending metal with his mind. A comment Edward hear’s most commonly is that when people watch magic of this nature on tv they assume they’re watching camera tricks or the performer is using stooges (they often are). When Edward performs you will see it for real, this is as close to genuine magic as you can get. 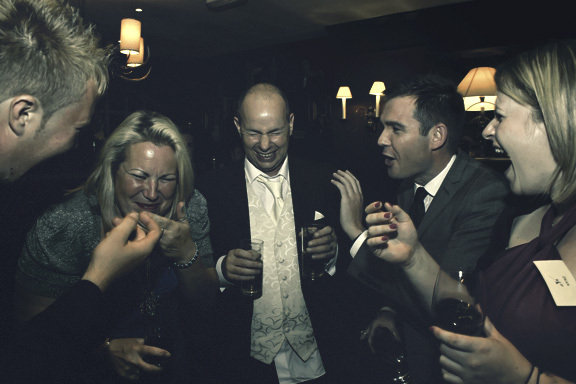 Edward is one of the few full time professional magicians in the UK. Each year he performs at up to 200 events. These can include corporate shows, drinks parties, weddings and dinners. Edward’s popularity comes from the fact that he tailors every performance to the event. At times he will create an original script or entire routines for a one off show. Even with the most standard of close up performances he will often end the show with a piece from his cabaret show for everyone to watch so no matter how small your event he will bring the theatrics of a full stage show to your party. 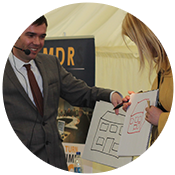 If you’re looking to hire a Bedfordshire magician Edward will create a unique performance for you that your guests will never forget. Edward has a number of different performance styles suitable for every event. 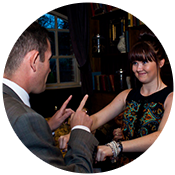 Close up is ideal for weddings and informal drinks parties, table magic is best suited to formal meals for larger groups. Edward’s cabaret show is designed for large corporate functions and charity shows and for events where you want a show but only have a small venue Edward has his parlour/dinner show. More details on all of these can be found on his SERVICES page. Imagine just thinking of the name of an old friend, Edward will describe them in detail before telling you the name. How about holding a coin in your hand and watching it bend as if it were made from chocolate! All this and much more will be witnessed in Edwards stunning close up and stage act. 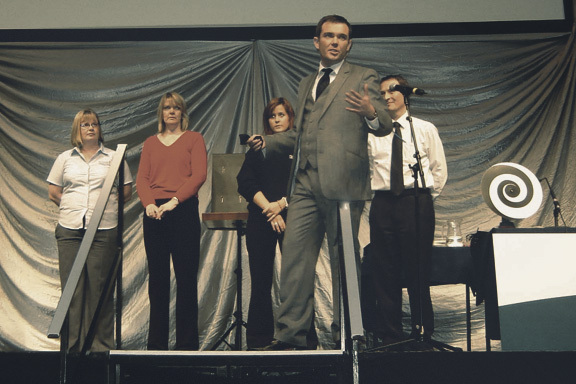 If you are looking to hire a Bedfordshire magician for your event you can not go wrong with Edwards act. Most of his work comes through repeat bookings and recommendations, you can read reviews HERE and on his facebook page HERE where you can also see examples of previous shows. 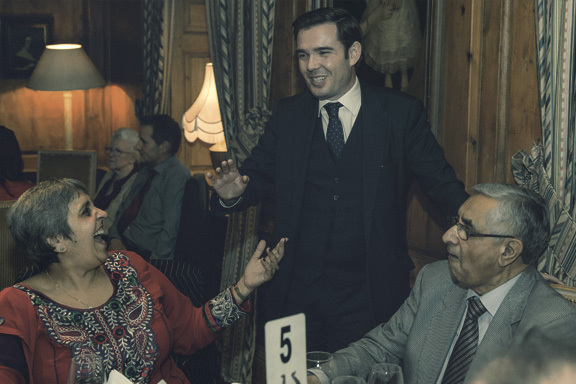 Contact Edward today to book a magician in Bedfordshire. If you would like to book a Bedfordshire magician for your event simply fill in the enquiry form below or call Edward on 07814 135569. I just wanted to send an email now we are back from our honeymoon to thank you so much for entertaining our guests and ourselves. You were incredible, so many of our guests have commented on how mind blowing and amazing you were, and Johnny and I complete agree. Thank you again for making our special day extra special. Absolutely Superb. We were stunned. Thank you so much. 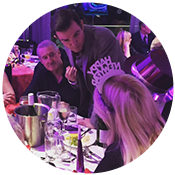 On Saturday night I was booked to perform close up magic by the delivery company DPD for their Christmas party in Dunstable, Bedfordshire. This was rather a late Christmas party but understandable that they would have it in January rather than December due to them, like me, being so busy in December. They had hired an entire bar for the event of about 200 guests made up of staff, family and friends. I performed for about 2 hours at a relaxed drinks party. Throughout the evening I mixed and mingled with small groups both seated at tables and standing. With each group I performed a routine of about 3 different mind reading experiments, involving all the members of the group in the various routines. Generally I would start off with a routine involving everyone, helping me discover who would be the best candidates for mind reading. I then moved on to a basic mind reading routine, maybe telling them the name and describing an old friend they hadn’t thought of for years or asking them to draw a picture, in private, before duplicating the drawing! Finally I would end the routine with a prediction, using suggestion and influence to show how easy to manipulate we all are. Had a great evening with everyone. Big thank you to DPD for the booking and to the HQ bar for looking after me. 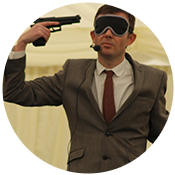 If you’re after a close up magician in Bedfordshire please get in touch to discuss your event. Corporate magic shows are a huge part of my weekly performances. Last night I had the pleasure to perform at Wyboston Lakes in Bedfordshire at an IT conference organised by NC Communications. Wyboston Lakes is a fabulous place to perform corporate events and I find myself their about once a month for a variety of corporate shows. This is the second time I have performed at this conference so needed to perform a brand new show as most of the attendees were also there last year. I started the evening with a 20 minute stage show. I stuck purely to mind reading and psychological illusion and had a fantastic reaction from the audience. Once the show was over I mixed with the delegates for evening drinks and nibbles performing some close up mind reading in a little more intimate setting. It was a fabulous evening was a fascinating group of people, I managed to stay an hour over the time I was booked for as I was having so much fun. A big thank you to everyone at Wyboston lakes and NC communications for the booking.If you’re after a magician in Bedfordshire whether for a corporate event or a private party please contact me on 07814135569 or info@www.edwardcrawford.co.uk for more details. On Saturday afternoon I had the pleasure of performing at a Wedding in the the village of Harrold, Bedfordshire. 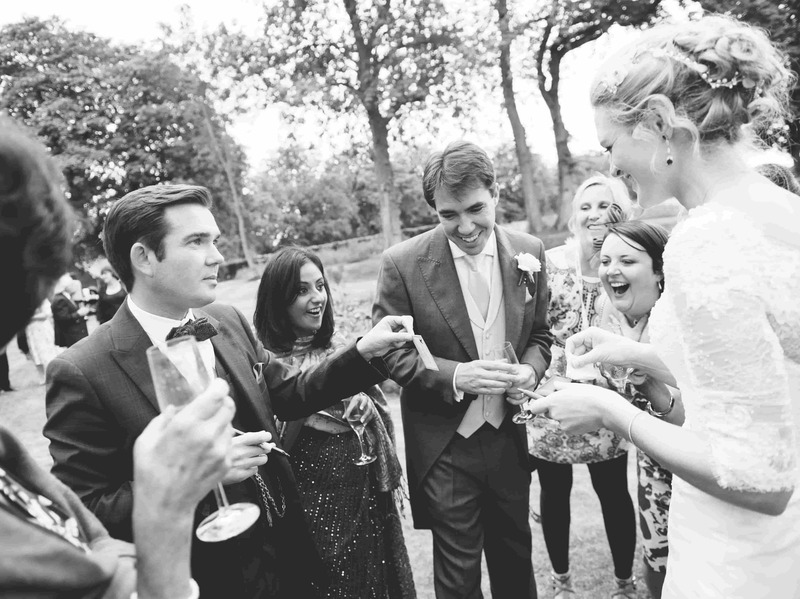 This was my absolute favourite type of wedding to perform at, super relaxed and informal. For once the bride and groom looked like they were actually enjoying themselves instead of being dragged off for photo’s every 5 minutes. I performed during the drinks reception as the guests arrived after the ceremony. This is without a doubt the best time for a performance at a wedding. Most people are standing around with little to do for a couple of hours so this is the perfect time to keep them entertained. I like to keep things casual at this time. I will mix and mingle with small groups performing a 10 minute routine for each group, reading minds and performing my unique style of mind magic. 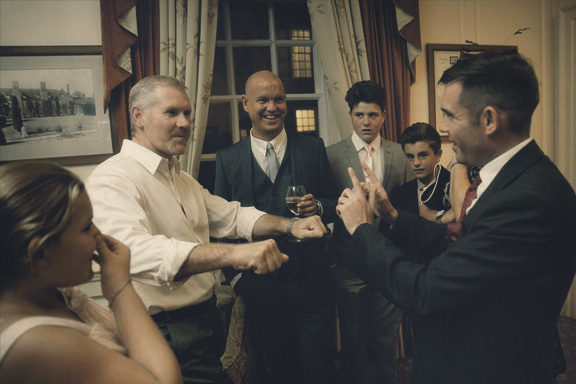 I made my way around the wedding party and had time to show each group a couple of routines. As is so common at weddings the bride and groom were busy during this period talking to people so I stayed an extra half hour into the wedding breakfast to perform for them. I always have a couple of special routines designed for the bride and groom, the finale involves everyone watching which is a really powerful routine and demonstrates the love they have for each other. It was a fantastic afternoon with a really lovely group of people. 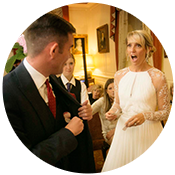 If you’re looking for a wedding magician in Bedfordshire please get in touch. On Friday afternoon I was hired to perform table magic at an event at The Barns Hotel in Bedfordshire. Now whilst I don’t perform traditional magic, table magic is the easiest way to describe this type of performance. The room was divided into 10 large tables with about 12 guests on each table. I would perform for each table in turn giving each group a private 10 minute routine in which I involved everyone at the tables. This is a really fun way to perform, the only negative with this type of performance is when there is a large centre piece on the tables and people on the other side of the table can’t see me. In this case I would move around the table throughout the performance ensuring I was only out of sight for a few seconds at a time! A typical performance when performing table magic. I might ask the entire table between them to choose a number between 1 and 100. whatever the number is I will show to have predicted it in advance by a piece of paper I will have placed on the table, prior to asking them to choose a number. This will be performed as a warm up to get an idea of the best people to work with. I will then move onto the mind reading. I may ask someone to think of the name of an old friend, I will then describe the friend and tell them the name. Other times I might ask someone to think of a random word or to draw a picture, I will then tell them what they are thinking of. Generally when performing at tables I will do a combination of all three. 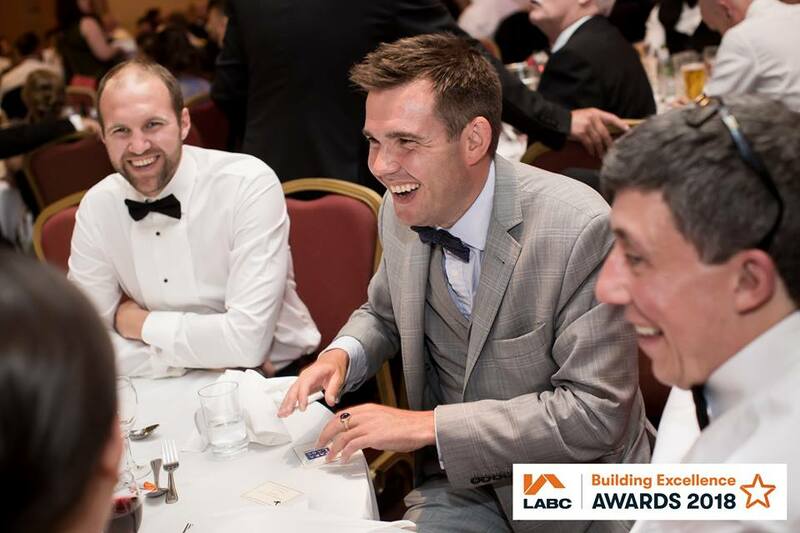 Table magic is a fantastic way to bring groups together and always a really fun way to perform. In this particular case I managed to get around each table twice performing a really diverse group of routines. If you’re after a Bedfordshire magician to perform at tables please get in touch for more details.